Soon to be the blade runner kitten, Cassidy is scheduled to become the first cat to be fitted with high tech prosthetic blade legs. Canada West Veterinary Hospital was happy to play a role in the recovery of the feral kitten, missing both hind legs. Found starving and with an infection in Langley, Cassidy was nursed back to health by Shelly Roche. 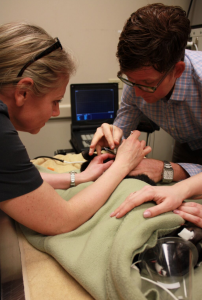 Canada West Vet, Dr. Mike Higgins recently treated the eight-month old Tabby cat with Botox Injections in preparation for prosthetic blades being attached to Cassidy’s limbs. In a few months, when the kitten is closer to being full-grown, he will undergo surgery at North Carolina State University.